Jinnah’s tragedy is that Pakistan disowned its father even before he could enjoy the fruits of his new national identity. The walls of history lose face when symbolism changes with the times. The Aligarh Muslim University is the new Hindu-Muslim battleground after ABVP students removed Mohammed Ali Jinnah’s portraits from the wall, where it had been hanging since 1938 when the university awarded him a lifetime membership.One man’s hero is another man’s traitor and cleansing history is an ideological industry. Statues of Confederate generals are being brought down across US cities. he movement to purge national memorabilia of Southern Civil War heroes began after white supremacists protested the taking down of one such statue last year; it ended in a mass shooting. The reason for bringing them down from their pedestals is that the Confederacy fought for slavery and white supremacy in America; something most citizens feel should not be commemorated or honoured. The first president in the White House kept slaves. So did some of his illustrious successors, such as Thomas Jefferson and Ulysses S Grant. But what America stands for today is what matters today. The flaw in the argument of our erudite apologists for Jinnah is that he ceased to be an Indian after August 15, 1947. He chose to found an enterprise based entirely on a faith that is today identified with terror not just by nationalists but also by most of the world. Pakistan seems to be dedicated to the destruction of India through terrorism and war. As its founder, Quaid-i-Azam is Pak’s most revered symbol—both of today and what it would eventually become since its journey began in 1947. So what transformed this urbane nation founder—once hailed as an “ambassador of Hindu-Muslim unity” by Gopal Krishna Gokhale—into a deeply polarising figure? How did a lawyer who defended Bal Gangadhar Tilak against the charge of sedition become an emblem of hate? How did Jinnah, who married Rattanbai, the aristocratic Parsi daughter of Sir Dinshaw Petit, become an icon of a country, which kidnaps and converts Hindu girls and forcibly marries them off to old men? 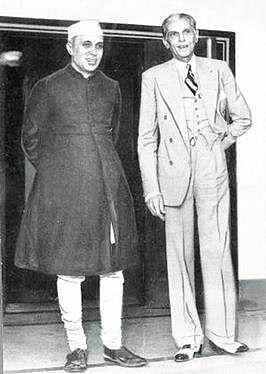 Our hyper-enthusiastic right wing youngsters, whose historical memory is worse that their PR skills, do not even point out that the Jinnah they hate is not a Muslim in any Islamist sense: he loved his whisky, enjoyed his pork sausages and patronised the finest tailors and shoemakers. But then, the new Hindu youth do not represent the India of the immediate post-Independence era either, just as Jinnah does not represent the Islam of today. Jinnah’s tragedy is that Pakistan disowned its father even before he could enjoy the fruits of his new national identity; he almost died a tubercular vagrant by the Karachi highway when his ambulance broke down and a replacement took time coming. Denied timely medical assistance by the Pak government, he died the next day—a broken gladiator of ambition and an orphan of history, leaving behind doubts that the neglect was deliberate. In this stormy context, a portrait of Jinnah adorning the wall of a university in free India is a travesty of hard won freedom, which he abandoned in his pursuit of power. The blank space a discarded photograph leaves on a wall is a fitting epitaph for an outmanoeuvred politician who hated Nehru as much as his detractors hate him, and Nehru, too. The issue is not Jinnah was secular or not. The issue is that he did not stopped ethnic cleansing of Hindus in Pakistan. Our monkey prime minister did not threatened Jinnah with dire consequence if did not stop ethnic cleansing of Hindus. that threat would have been more than enough to stop the exodus. Sir India is an impossibly tolerant terrain, where the hate monger like late sri EVR who abused the religious practices of Hindus in particular and enjoyed breaking of their sacred idols by his followers is still 'worshipped' by the dravidian parties in Tamilnadu! The late CM convicted by the top court for accumulating illegitimate wealth while in power is celebrated as icon of 'good' governance by placing her portrait in the Assembly, suggesting to the legislators that they can earn ill-gotten wealth but just do some good work to be in respectable light in history! Another high profile convict in Bangaluru jail walks out for shopping in civil dress that is caught in camera and flashed by media as well for public view but the courts did not take suo motu congnizance of the serious lapse of the Jail dept. The officer who exposed the corruption in jail was transferred and the case is waiting for a safe burial! In this country i don't think Jinnah's sins merit no more discussion than as just one more aberration in the society of new grown political 'leaders' creating news for the media! It was Saroini Naidu who called him "ambassador of Hindu_Muslim" unity. dear brother Rau, he would have started quite decent but fallen over time due to weaknesses overriding his earlier sentiments for unity.